Take a stand and show you care about people with serious blood disorders like leukaemia. Buy and wear your bandana on 12th October and contribute towards saving a life. The campaign is fun, hip and happening and involves Ambassadors of Hope for The Sunflower Fund: Corne Krige with his family, Benito Vergotine, Nonala Tose and Liezel van der Westhuizen. Featuring in the TV advert together with South Africans of all ages, they pledge their support and ask that you do too. The bandana design is fresh, distinctive and is a trendy fashion accessory. Available in 8 different colours, it appeals to everyone from the young to the young at heart! Buy your brightly coloured bandana from Pick n Pay, Round Table, selected Makro stores and the online shop, Zando from 15th August. It’s all about saving lives. Funds raised through National Bandana Day go towards paying for the expensive tissue typing (DNA) tests for new stem cell donors to join the South African Bone Marrow Registry (SABMR). Behind the campaign, stand the cancer patients who face a very daunting task of fighting for their lives. This unfortunately is a reality for countless people and for many; their only hope is to receive a life-saving stem cell transplant. “Please support this campaign and help make a difference as together, we can save more lives. We cannot do this without you. 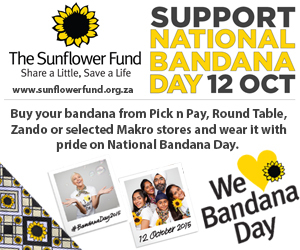 To the public of South Africa, I have one question for you… We Heart Bandana Day, do you?” asks Tarryn Corlett, Chief Executive Officer of The Sunflower Fund. Come on South Africa, “Share a Little, Save a Life”… buy your bandana to give hope to someone else and wear it to show support towards the brave fight that these patients face daily. ← Woolies my school – PLEASE help us win R70 000!! !